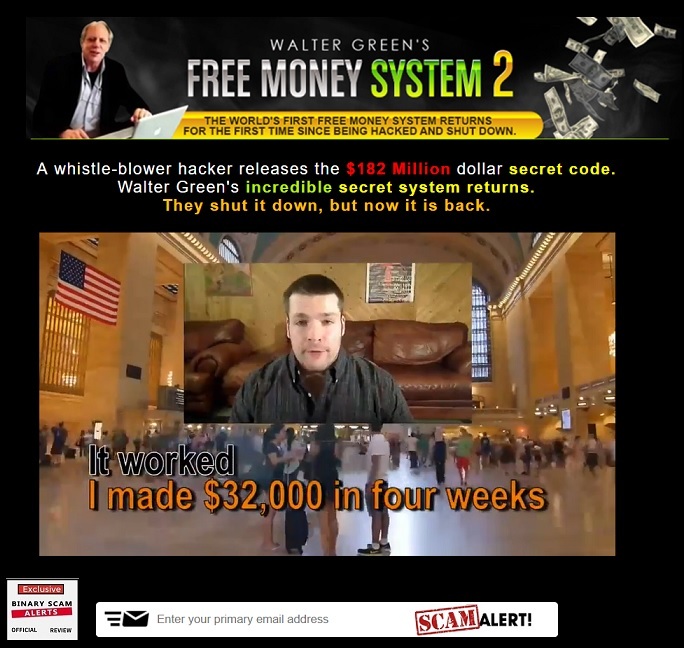 Binary Scam Alerts » Scam Reviews » Free Money System 2 Review, Walter Green Scam is Back! The Free Money System 2 software and trading robot by Walter Green represents the quintessential binary options get-rich-quick scheme. In our revealing review and investigative report we will expose this recycled scam, and proceed to show you exactly how unethical affiliate networks spin their lies and weave a clever tapestry of deception designed with the sole purpose of defrauding unsuspecting opportunity seekers such as yourself. It is without a doubt that the Free Money System 2 (AKA Millionaire Blueprint) reeks of thievery and dishonest internet marketing tactics. On a side note, we already know for a fact these criminals are directly responsible for ruining the lives of thousands of families across the globe. It seems the lure of easy money at your finger tips is just too tempting, and unsuspecting would-be traders fall prey to this intricate web of lies and deception. We can’t stop you from spending your hard-earned money on this vile and manipulative scheme, but we can warn you and advise that there is nothing genuine or legit here. The people pulling the strings behind this production are well-funded and highly motivated. They are experienced charlatans and cheaters, and are gunning for your wallet so make sure you never divulge any sort of credit card information. Additionally, their primary method of recruiting victims is SPAM email marketing, so please refrain from clicking any links and don’t even try to unsubscribe just move them to your spam box and that’s it. Keep reading to see how we exposed the Free Money System 2 and why we believe it is a verified investment SCAM and worthy of being blacklisted. Below you will see the main sales page of Walter Green’s Free Money System 2. And here is the evidence our staff was able to produce. 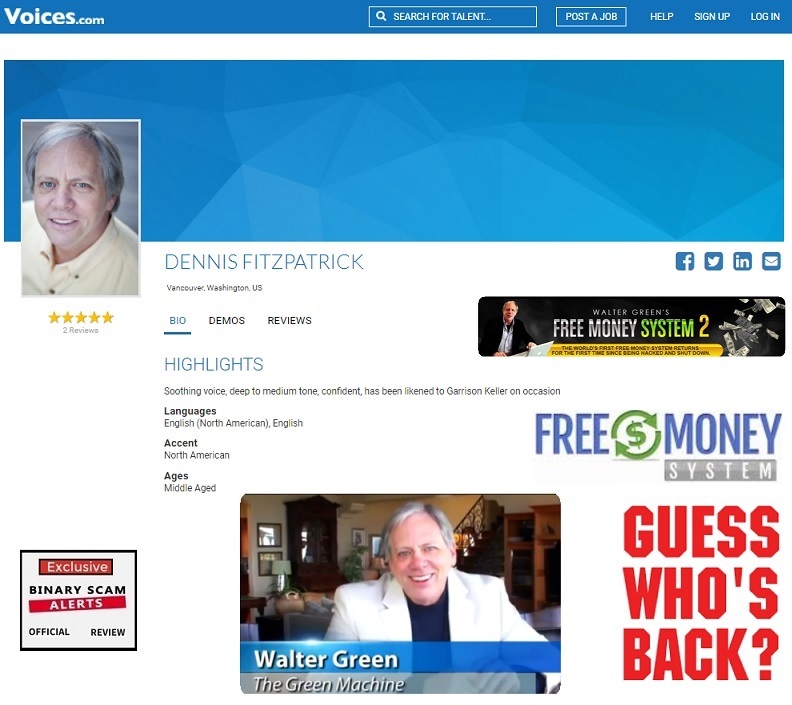 It’s plain to see that Walter Green, AKA the Green Machine is actually an actor named Dennis Fitzpatrick and the rest of the testimonial section is packed with fake fiverr.com actors such as dclover1. The amount of hyped-up claims and exaggerated statements of instant wealth are infuriating. It’s a repetitive strategy which is taught in communications departments in universities all over the world. If you actually count the amount of times they relay the message of making money a we did you will be shocked, as it comes out to 26 times in various formats. 3 years ago I tried Walter’s software, it worked! “I made $32,000 in 4 weeks”. Then it stopped, but three years later Walter’s team contacted me. After that we have a barrage of fake testimonials laying it or real thick about how much money the software made for them. In 2013 a computer code was released, a code that changed the lives of over 2,000 people. It was called The Free Money System, and was the most advanced income generation software ever created. It made over 152 Million Dollars for its first beta tester, but then Walter Green vanished into thin air. “I need to talk to someone about Walter Green, he’s in grave danger”. After receiving anonymous phone calls, it appeared that he was being monitored by a number of government intelligence agencies. His videos have been copied and abused by scammers to promote phony software. After being hacked by government agencies after three years the system is back online, hosted on secure servers and protected from hackers. Walter’s whereabouts remain unknown, but for the first time after three years his original software is available again for action takers who want to make a change in their lives. Well, there’s nothing free here despite what the name would suggest. It’s going to cost you at least $250 to try out this crummy software, and that money will be charged to your credit card by an offshore processing company associated with one of the rogue brokers integrated in the software. What we are witnessing here is a pitiful attempt to launch a rehashed mega-scam. The actors play their parts and are compensated for it. The hyped up claims and exaggerated figures of massive profits at the click of a mouse are constantly being injected into the irritating narrative. The bank accounts are photo-shopped, and the whole thing reeks of deception and manipulative sales tactics. We are actually the first ones to expose this filthy scheme, so watch out for the new reviews which may seem to be authentic but in reality are not. The hot ones to watch out for are Bitcoin Code and Quantum Code by Michael Crawford. If you are constantly deliberating and not sure about which app is right for you, then you are not alone. Fortunately our team of researchers has dug in deep and compiled a short list of tested money-making machines which have endured the test of time. These are all proudly showcased in our recommended section. The original Free Money System and the second one (2) are both scams and blacklisted in the harshest and most severe form in our detailed review. 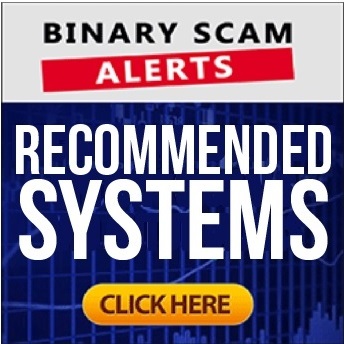 We can’t overstate how dangerous and misleading this software is, so we are sending out an urgent warning to all our members and viewers to avoid this malicious piece of fraudulent trading software. We honestly searched, but could not find one thing about this system which is legit or genuine, besides the intent of the affiliates and producers behind it to defraud you and steal your money. This is a blatant and rude attempt to cash in on people’s financial hardships and bait them into registering with cyber-crooks disguised as offshore brokers. We know the people behind this system have criminal records for committing cross-border fraud, identity theft, software manipulation (rigged and set to lose) and of course credit card fraud. In light of all the evidence and findings our staff was able to produce, we have no choice but to blacklist the Free Money System 2, and recommend out members and subscribers seek alternative investment channels. Join our Facebook Page and YouTube Channel to get informed and receive updates.